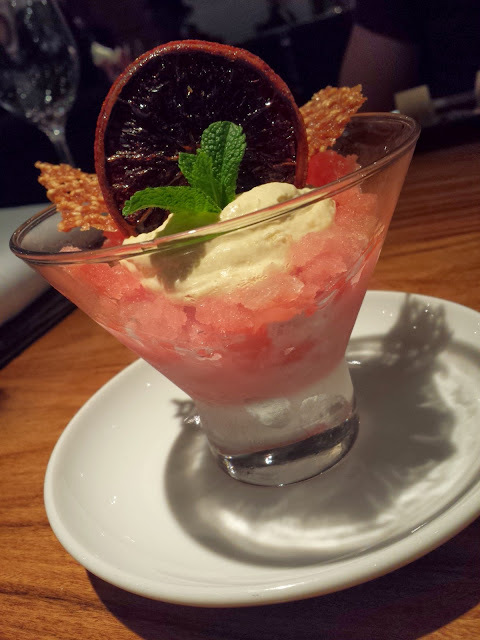 Restaurant Review: Cinnamon Kitchen | Avellana. M and I first visited Cinnamon Kitchen a year ago where I experienced some of the best pork ribs I’ve ever had. Seeing that Bookatable had a special deal on, we thought it was about time we returned for another visit. 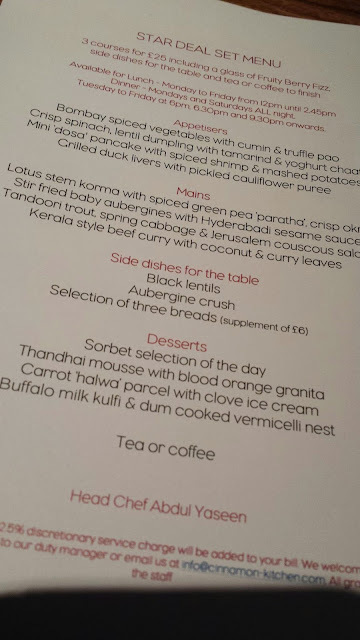 The offer was £25 and included three courses (plus 2 side dishes), a cocktail, coffee and petit fours. Pretty good value, I thought. The offer was also really appealing in that it allowed you to eat any time on Saturday night. Most set menus are such good value because they only allow dining at awkward times or days – either really early or late or not Friday and Saturday night. Because Cinnamon Kitchen is in the city, Bishopsgate, it meant that off peak dining was actually a Saturday and therefore available for booking. Perfect for the two of us. 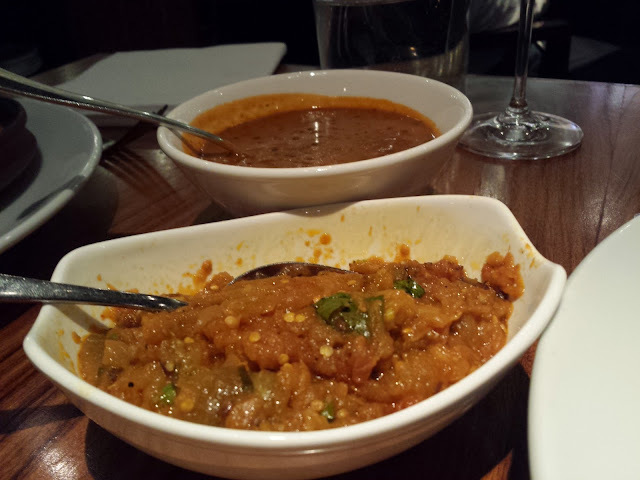 Cinnamon Kitchen is an Indian restaurant and I was pleased to see that the set menu was highly varied. 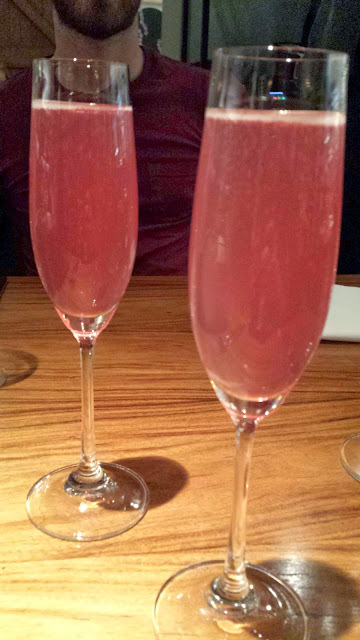 We kicked things off with our berry fizz cocktail. M ordered a dosa to start – a kind of Indian pancake. I went for lentil dumplings. The texture was a little odd but I loved the crisp spinach. 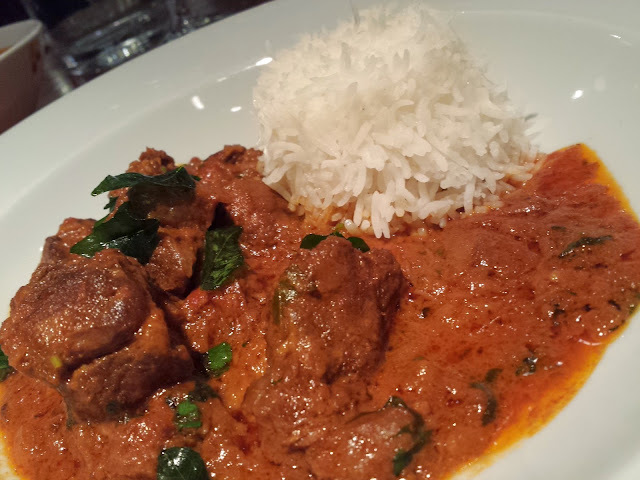 We shared our mains of Kerala beef curry and lotus fruit korma. The beef was beautifully tender but the sauce was just spicy with no other flavour. 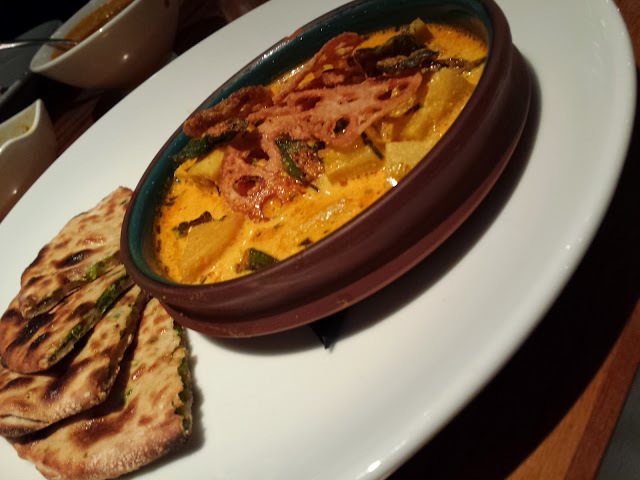 The lotus curry was also pretty hot, fine for us as we’re both fans of hot food, but again it didn’t taste of too much. The accompanying paratha was also a little too oily for my liking. These were accompanied by aubergine crush and black lentils. 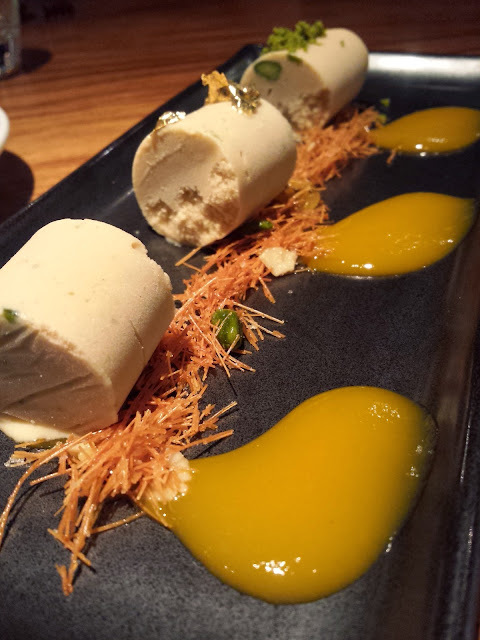 The meal was saved for me by my dessert – a creamy Thaandai mousse with granita. Beautifully contrasting textures and flavours, this was real winner. M was a little underwhelmed by his kulfi. 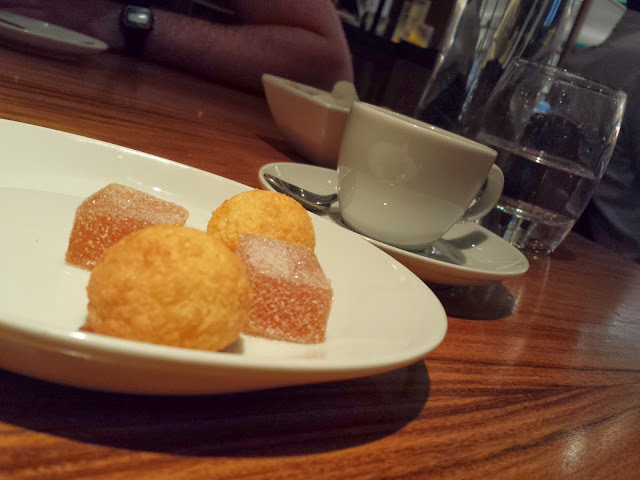 My favourite part was probably the coffee and petit fours – the macaroons were proper coconut ones and were utterly delicious. All in all, the whole experience was little disappointing. Zumbura is superior in every regard. And, although I know the menu was very well priced, it’s still important that you properly enjoy your meal, regardless of whether you’re dining on a special offer. Maybe we just got Cinnamon Kitchen on a bad day as I loved it the first time we visited. I know I probably haven’t sold you on Cinnamon Kitchen based on this review, but if you’re at all interested, you can find the offer we used here. It’s available until the 24th June 2014. PS Apologies for the terrible photography. I stupidly forgot to bring the camera so phone pics had to do.